the volume of the machine is low compared to the big bros. The first problem , which may seem quite hard to face, for me became not so limiting. The air-space between the internal of the pad and the sensor is quite far, more than 1,5 mm, so you have to hit hard to make the rubber to touch the sensor. When you use the machine intensively the rubber of the pad bank tend to behave in a more soft way because of the use , so the pads beaten more often get more “easy to manage” with velocity on and react better to the thump of the fingers. The second point is the volume. Reading the manual you can see that the 500 has 12dB less of output volume than the 1000 and 2500, this is quite a lot of volume! The only way to get it play louder is to use an external preamp or pump up the gain in your mixer. The problem is caused by the fact that at akai have studied the amp section for a battery powered use, so there are no special settings to get better results. The one thing to avoid is to pump up the volume of the pads, and get the headroom under -6dB. Setting the sample volume to 100 will lend for sure to a highly annoing overdive of high frequencies and the total lost of fidelity of the sample played. My advice is to get the master volume knob to max, headroom to -6dB, and sample volume between 70/90. In this way you will have a godd result and no overdriven frequencies, then using the gain in your mixer you will get the right volume to fit the 500 in the mix with the other instruments . The third and quite absurd downfall of the 500 is the strange behaviour of the filters. I noticed that the LP filter (used as preset in every program) is the main reason that leads to lower volume and distorted sounds. Sampling a closed hat , the sample sounded good in the “preview” (pushing “play”) while had a different “fidelity and a total loss of high frequencies and a lot of distortion in the program. Switching the filter from LP(lowpass) to “–” (that means bypass) the sample sounded good again as in the preview. So the filter was the cause of that awful sound! I don’t mean that every sample sounds bad with the filter on , but I noticed that quite all the samples gained a little volume and a cleaner definition bypassing the filter, and however some samples sounds very bad with the LP filter on, especially the ones that are rich of high frequencies as hats, cymbals, etc..
Akai is famous for their tradition in making samplers and recording machines. The MPC series is a sampler and sequencer combo that made history. The MPC60 (the first MPC ever!) was the evolution of the sampling drum machine LINN 9000, a really revolution in the drum machine contest in the 80s. The MPC concept is basicly a drum/percussion sampler with a powerful midi sequencer inside a box with sensitive touch pads. That combination seems like a little rhythm making studio in a box, because you ‘re not limited to standard drum sounds but you can sample your own sounds and use it in combination with the sequencer to create a composition that’s something more than a rhythm. After the 60 came the 3000 that offered more memory and some adds like easy scsi storage, than the 2000 that enhanced the possibilities of the machine with graphic editing and the 2000xl with multi timbral and melodic capabilities. 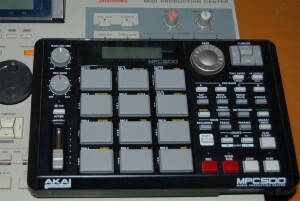 After the the 2000xl and 4000 Akai started a third generation MPCs: the 1000 and than the 500 , 2500 and now the 5000. The new mpcs have a new dimensions that’s to compensate softsampler limits and the stability, they take the mpc concept a step ahead , to create somenthing that does not compete with softwares but that can be used with sw and workhorse for live duty. The MPC 500 is the lighter and cheaper model of the serie, it lacks some interesting features of its bigger bros but has some winning points! the volume of outs in this machine is lower than the others MPC. the rubber sensitive pads are harder to on the touch, it seems you have to push them harder to get velocity 127! 12 pads instead of 16… well it maybe a limitation but I find useful instead! When I use tuned samples 12 pads are like 1 octv keyboard, so I use to samples one sound for octv and then with 4 samples I can play a 4 oct sound without the feeling of loosing the “reality” of the sound, because 1 sample does not stretch too much. And using the 12 levels the sample has 1 octv play! The 500 has only the stereo out, and this is a limitation if you want to do record a bunch oof tracks at the same time, but if this is not your need the absence of the multi outs is not a bad miss. One important aspect of this machine is the particular “low” volume output. In a A-B test with the MPC2000xl the 500 outputs half the volume of the 2000 with an headroom set not to have distortion or degradation of the sound. I think at AKAI designed this machine as a battery operated , so to let the batterys last longer they reduced the amplification consumption, leading to a lower volume. I ‘m honest, this is one of the things I don’t really like in the 500, because this aspect influences the sound, annd if you want a “clean” sound you have not to push the headroom to 0dB and stay calm with the mixer section. The more you try to pump the sound from the internal volumes, the more it sound harsh or with a light distortion on higher frequencies. But if the volume are set in the right way (70/80 on the mixer, and a headroom of minimum 6dB) everything works very well, the sound is clean and punchy. The only way to get the 500 pump louder is to rise the volume on your mixer or use a preamp/compressor. The sensibility of the pads is another downfall of the 500. They have a particular curve that can be tricky to manage at first. I usually tend to switch velocity to 100% and play the main rhythm (kick and snare ) then I switch velocity on and start playng with the note repeat in order to make a quantised rhythm with velocity movements. The other alternative is to record every track with velo at 100% and then edit the velocity using the slider in realtime. Apart from these points the 500 has some major strenghts! can work as a multitimbral sound generator with /without using its own sequencer. The sampler engine is complete with even resampling and easy editing. The 12 levels (to play the sample chromatically) works as on the previous models, and the interesting aspect is that every motion recorded is realtime and fluid.